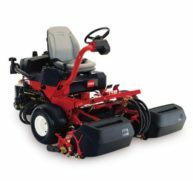 There has never been a greensmower with as much versatility as the new Greensmaster® 3250-D. A large, 3 cylinder, Briggs & Stratton®, Vanguard/Daihatsu®, liquid cooled, 21 hp (15.7 kW) diesel engine provides the performance needed to use on greens and all areas around greens. Up-front and low seating, an adjustable steering arm, and fingertip controls all increase operator comfort and productivity. All components, especially those that require daily inspection and routine maintenance, are conveniently located for servicing. The Greensmaster® 3250 has fewer hydraulic lines and connectors. All hydraulic components are positioned for easy visual inspection. The unique Series/Parallel System design features out-perform any other 3-wheel drive system on uphill or sidehill operation. This system guarantees power to the wheel which requires it most. The placement of the center cutting unit, located between the the front traction wheels, along with the front center basket removal, allows a low mounting design of the transmission and engine. This lowers the center of gravity, giving the machine much higher hillside stability. Toro’s riding greens mowers are equipped with safety interlock systems. Machine cannot be started if the implement or traction is engaged. Machine can only be started if brake is engaged and operator is seated. Reels cannot be operated in transport speed or without operator in the seat. The dependable Turf Guardian™ leak detection technology alerts the operator if a leak occurs. Optional on the Greensmaster® 3250.